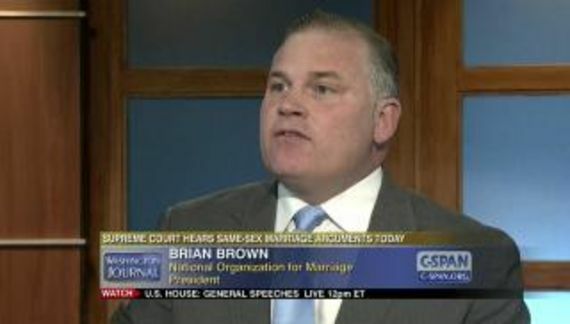 It was CRC that arranged a Washington Post puff piece about Brian Brown in 2009. Shortly after the story appeared, the Post's ombudsman issued an apology wherein he wrote "I agree that the story fell short." CRC is currently run by Greg Mueller, the communications director for Pat Buchanan’s 1992 and 1996 presidential campaigns. This important ruling shows how far out of the mainstream the decision in the Proposition 8 case was, and totally undercuts the legal conclusions that the San Francisco court used to invalidate Proposition 8. We hope that the decision will help the U.S. Supreme Court to see the importance of granting certiorari in the case so that the good of marriage will be maintained across the country, just as it was in Nevada. This ad hominem attack is plainly stated bigotry. By this logic not much would get decided by judges. Indeed, it is oddly ironic given that the Judge in the case that they are heralding was predisposed to bias by virtue of his religious convictions. There was no request for his recusal. Nor, for that matter, was Judge Walker asked to recuse himself in spite of the fact that it was an open secret that Walker is gay. It is also ironic that Walker's first nomination to the federal bench by President Reagan became stalled in the Senate due to the perception that Walker was insensitive to LGBT issues. Note that Eastman does not attack any aspect of Judge Walker's ruling. Nor is he specific about exactly which "values" Judge Walker holds. There is a very good reason for that. Walker's 136 page opinion in the Prop 8 case was meticulously detailed and carefully researched. It denies any charge of bias. While the ruling by the 9th Circuit to sustain Walker was two to one, the opinion regarding whether Walker should have recused himself was unanimous. There wasn't so much as a hint of bias.